U.S. patents list the country of residence of the inventors at the time of patent issue — although I imagine that many applicants do not update residence during application pendency. 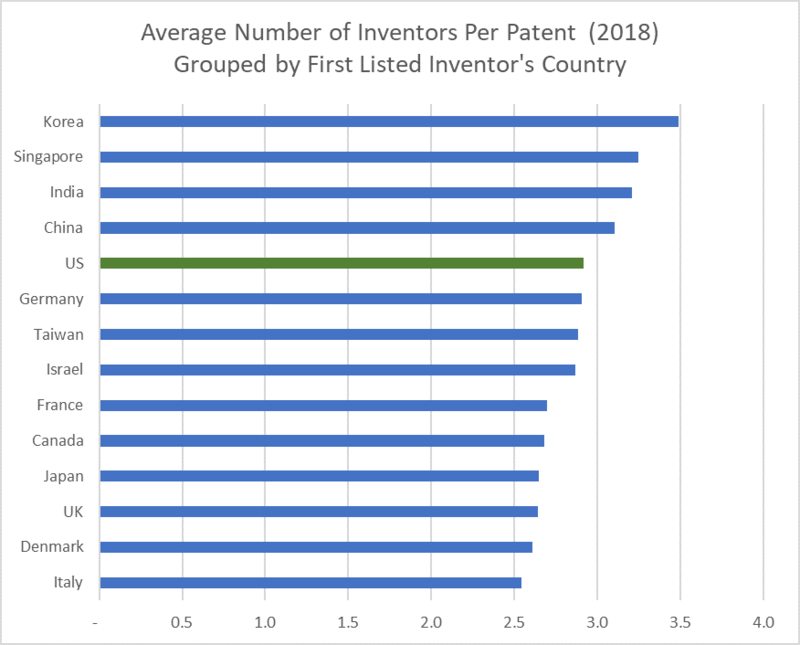 The chart below looks at the first-listed inventor for recently issued patents and then reports the average number of inventors per patent for each country. An interesting caveat to this report is that about 8% of U.S. patents involve cross-border inventions. These are multi-inventor patents with at least two of the inventors residing in different countries. The low-hanging-fruit-has-all-been-picked is about (at least) 120 years old. See the famed Charles Duell quote. This is a myth, Billy. Good lord, when will the maximalists grow up? You don’t get the point, do you? It just does not matter whether the quote was apocryphal or not: the presence of the quote and the context of that quote HAVE been around. Typically, animated charts are more irritating than informing, but I think that a chart showing the data that was broken out in the previously related thread (at post 4.1) that cycles through the span of years and captures the non-proportion (actual of single versus 3+) for each of the listed countries here might show interesting aspects of both global and Sovereign to Sovereign relative trends. Dennis I have to say, I’m aghast. Japan and UK have exactly the same showing. I wasn’t expecting that. And Japan significantly fewer inventors per case than Germany and the UK. This does not correspond at all with my sense, built up over 40 years of practice, that cases from employers in Germany and Japan routinely name more inventors than do companies in the UK. Not surprising, of course, is that the Asian countries name the most inventors. But why the aberration for Japan? Perhaps an employer reaction there, to the famous case of that one blue diode guy who got a multi-million pay-out under that country’s employee-inventor law? Who knows? But I very much enjoyed MM’s opening comment. Malcolm’s comment below is actually enjoyably clever. It strikes a nice mix of sarcasm, innuendo and realty-based (but poking fun at that reality) elements, without his usual blatantly mindless ad hominem. Not surprising, of course, is that the Asian countries name the most inventors. Hm, I think that you are underplaying this a bit. Over on the other thread, multiple voices suggested that the reason for the growth of inventors per patent was the rise of Asia, where multiple inventorship is allegedly more common. What this chart shows is that the myth of Asia favor large numbers of inventors is just that—a myth. Korea is genuinely out front in terms of number of inventors. China (3.1 per patent) and the U.S. (2.9 per patent) are basically identical. Japan is actually near the low end in terms of average number of inventors per patent. India and Singapore are both on the high end, but when you consider how few patents originate from either India or Singapore, surely these two cannot be doing much to drive the increase in average numbers worldwide. In short, Asia as a whole is really no different in inventorship numbers than any other continent. Korea is on the high side, Japan on the low side, and China is about even with the U.S. In other words, the rise-of-Asia hypothesis can be dismissed as an explanation of the growth of average number of inventors. For my part, I favor the low-hanging-fruit-has-all-been-picked hypothesis. I am not sure, however, how one can test that hypothesis with these sorts of average numbers data. For all of your (rather correct) observations above, you kind of trip from there moving to your “go-to” theory. The US is clearly the greenest country amongst those that are listed here. An interesting caveat to this report is that about 8% of U.S. patents involve cross-border inventions. I spoke to my comrade Dr. Gerhard Moser about this and he was very pleased. Over 70 years ago, Berszhonetsky predicted, in his historic paper modeling the various dynamic modalities peculiar to pseudo-parallel economic (and mostly counter-) revolutions, that a trend in the patent system towards a more diverse listing of inventors (country-wise) was one of several signs presaging a rapid conversion to a one world government. Specifically, he predicted the trend would begin to present itself strongly around the same time that inventorship increased into the range of 3-4 inventors per application. All of this would be indicative of the diminished power and stature of individuals in the global regime, and would be accompanied by the consolidated power of what he called chudovishe-miolnir (roughly translated as “monster-business”) and an worldwide increase in the consumption of kombucha. I’ll have more on this topic at the very beginning of April.